Coughs can be very confusing but what you might not know is they can be divided into just two types: dry coughs, felt in the throat, and chesty coughs, felt in the lungs. It is not always easy to distinguish a dry cough from a chesty cough and it becomes even more difficult if your cough changes over time. Dry coughs are caused by an irritation of the upper airways due to foreign particles, dust or a throat infection. This type of cough is non-productive: no mucus or phlegm is produced. A dry cough is also synonymous with a tickly, or irritating cough. Chesty coughs are characterised by the formation of mucus or phlegm in the lungs, and are classified as a productive cough. The cough reflex is triggered to help raise the phlegm, in order to clear the lungs. A chesty cough is also known as a mucus or catarrh cough. Bronchostop is traditionally used to relieve any type of cough*. If you don’t really know what type of cough you have, or if your cough changes from one to another, Bronchostop takes the hassle out of choosing a solution. Traditionally used to relieve any cough*. Bronchostop Cough syrup contains a combination of ingredients not commonly found in other cough products used to relieve any cough: dry, tickly, chesty, mucus or catarrh. Bronchostop is a traditional herbal medicine used to relieve any cough, based on traditional use only. *Exclusively based on traditional use. 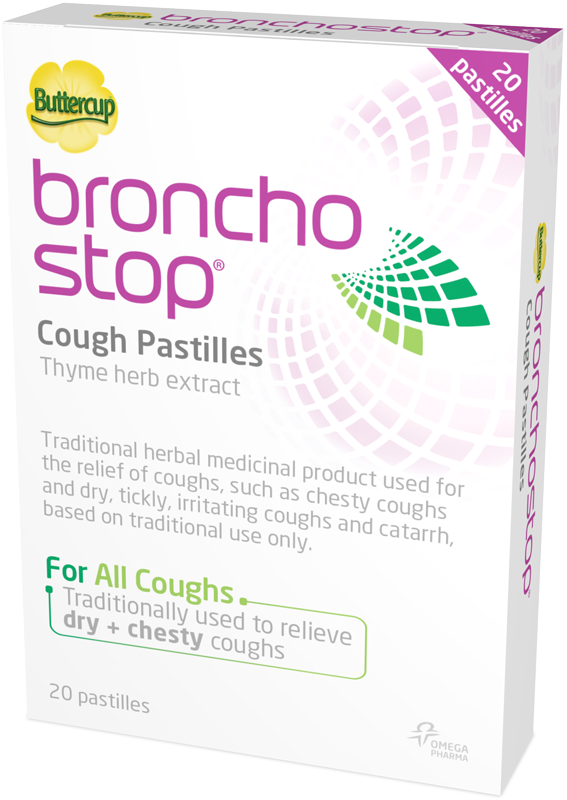 Buttercup Bronchostop Cough Pastilles & Syrup contain thyme herb extract. These are traditional herbal medicinal products for use in the relief of coughs, such as chesty coughs and dry, tickly, irritating coughs and catarrh, exclusively based upon long-standing use as a traditional remedy. Always read the leaflet. For more information regarding Bronchostop Pastilles visit https://www.medicines.org.uk/emc/medicine/29342 or for Bronchostop syrup please visit https://www.medicines.org.uk/emc/medicine/29343. 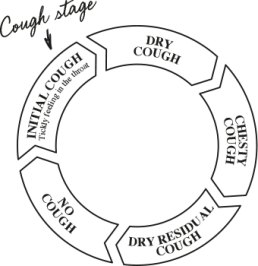 Bronchostop – traditionally used to relieve any cough. Where can I buy Bronchostop? You can purchase Bronchostop for most pharmacies and supermarkets. Is Bronchostop safe to use? Bronchostop is considered safe for use when used in line with the instructions for use. Where can I find out more information related to Bronchostop? All Bronchostop products can be bought over the counter and do not require a prescription. Who do I contact if I have questions about Bronchostop? Has there been an artwork update? There has not been major update to the Bronchostop artwork recently. Can I use more of the products in Bronchostop range at once? 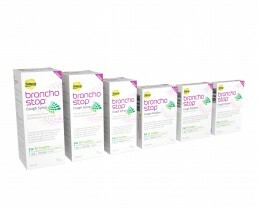 We do not recommend taking more than one product in the Bronchostop range at the same time. We always recommend using products in line with the instructions provided with the product. Can Bronchostop products be used with anti-hypertensives & anti-depressants? Yes, Bronchostop pastilles and the syrup can be taken with hypertension, blood pressure, anti-depressant medication. However, it should be noted, that no interaction studies have been performed with the product. This is typical for herbal products. Can Bronchostop products be used with Warfarin? No specific interaction studies have been conducted on the active ingredients in Bronchostop and Warfarin. Generally botanical (herbal) products may influence patients response to warfarin (thus necessitating close INR monitoring). Tell your healthcare provider about all the medicines you take, including prescription and non-prescription medicines, vitamins, and herbal supplements. Some of your other medicines may affect the way warfarin works. Certain medicines may increase your risk of bleeding. 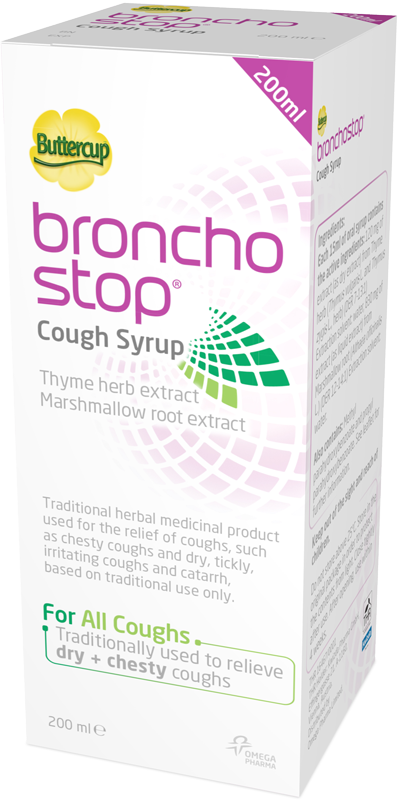 Why is marshmallow root an active ingredient in the Bronchostop Syrup but not the Bronchostop Pastilles? Marshmallow root extract is not currently an ingredient in the pastilles. Thyme herb extract acts as an expectorant, with acacia (Arabic gum) and the process of sucking known to have a demulcent effect; the composition of Buttercup Bronchostop Cough Pastilles includes both thyme herb extract and acacia (Arabic gum). Are Bronchostop products gluten free? Bronchostop Pastilles and Syrup contain no gluten and there is no exposure to gluten during the manufacturing process. Is any alcohol used in the manufacturing process? No alcohol is used during manufacturing of Bronchostop products. Are all of the Bronchostop syrup/pastille ingredients natural? 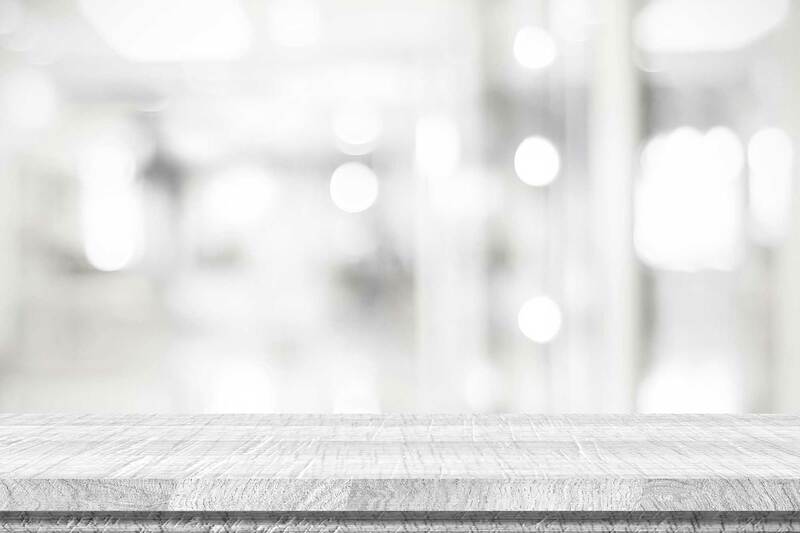 Although Bronchostop is registered as a THR, it may contain synthetic ingredients such as flavoring, as well as the herbal ingredients. Are any of the Bronchostop products tested on animals? Preclinical studies have not been performed with the products Bronchostop Sine and Bronchostop Pastilles, except one in vitro study on genotoxicity (AMES test) that has been conducted with the finished products. Animal studies have not been performed and were not required for the registration of the products as Traditional Herbal Medicinal Product, where the safety of the product is based on long-standing use in humans as well as on bibliographic data available from published literature. Does Bronchostop syrup or pastilles contain codeine? Neither of the Bronchostop products contain codeine. Boots is the UK’s leading pharmacy-led health and beauty retailer. With over 2,500* stores in the UK, its purpose is to help their customers look and feel better than they ever thought possible. LloydsPharmacy is a leading community pharmacy and healthcare provider with over 1,500 pharmacies across the UK, mainly in community and health centre locations.